If your partner says “Hey, you crossed the line with that comment” we know we are in trouble. My kids often say to me while pointing at the floor behind me; “Hey dad! See that line?” (The line between what they see is funny and what I think is funny.) “It's behind you!” If I asked you “Is your health above or below the line right now?” you would have an answer without either of us needing to define the line. This is true in your personal finances, your career, how you parented yesterday. We all know the line exists, we just don't talk about it that much. My friend Michael Henderson, an anthropologist, wrote about this in his great book Above the Line. I highly recommend it. Michael coached me to live and lead above the line and the ideas he shares with me still resonate years later. I would not have a conscious awareness of this incredibly important idea if he was not in my life professionally and personally. His culture work is game-changing, and his keynote presentations are extraordinary. As people we want to live above the line as much as possible, to be the most caring, warm, open, and inclusive people that we can be. As leaders we also need to lead from above the line as much as possible, with courage and compassion, making our leadership as loving as we can. And yet — even though I am a leadership expert — despite all my efforts I often catch myself below the line. No matter my failures or foibles, however, I strive to get above the line in everything I do. For me, I have two simple barometers that let me know whether I am above or below the line: The first is my patience – or lack thereof – for pedestrians. I’m sure you’ve had the experience at the airport when a luggage-laden passenger steps off the escalator and, unsure of their next move, makes no move at all and stops barely a metre from the escalator exit. When I feel my face flushing and my blood pressure rising, I know I’m below the line. My second barometer is how I drive; if everyone on the road around me is an idiot and I’m tempted to shout every time someone changes lane, then I am below the line. I try to drive in a zen state, radiating love to all, slowing down, easing the way for all to get safely to their destination… but sometimes I rage against the selfish S.O.B who raced down the left lane and cut into a long-suffering queue of traffic. I opened this Talking Point by saying that we don’t need to define the line, but if you’re familiar with me and my work you would know that I love models. Not diagrams, models. Mental models, frameworks for understanding. For me, in its simplest form, the line is ‘courage over fear’. For me, in its simplest form, the line is ‘courage over fear’. 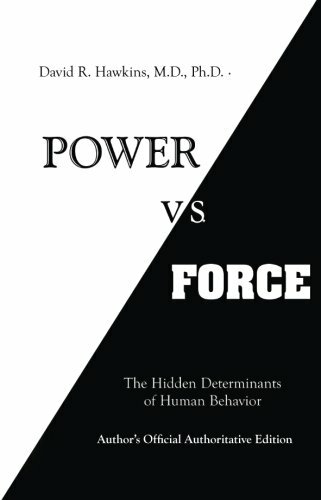 My point of reference is a book called Power versus Force by Dr David Hawkins. He uses kinesiology to rank the key words that capture the most important humanitarian concepts. Words like ‘peace’, ‘guilt’, ‘pride’, ‘understanding’, ‘forgiveness’, ‘anxiety’, ‘despair’, etc. He uses kinesiology to decide how aligned each of the concepts captured by these words align with what it means to be human. His method isn’t science, but I’ve found it enormously useful. The words we use can give a good indication of whether we’re above or below the line. Pride feels good, but by Hawkins’ measure, it’s below the line. Using Hawkins’ table of words as a guide, it becomes clear that it’s much more useful to focus on gratitude, rather than pride. It's quite a practical tool, giving leaders choice and a 'tuning fork' approach to leading above the line. In essence, leadership is about bringing out greatness in the people around you. I think leadership is about this idea more than it is about vision, or strategy, or planning. Fix your attention on this one thing as a leader, and you end up with a superpower of sorts; the leadership capability to inspire and not simply inform. 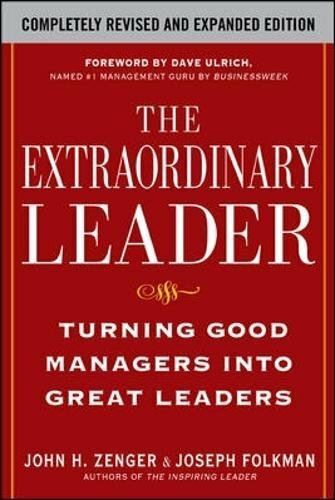 Zenger and Folkman make the case that inspiration is an ultimate leadership capability in their book, The Extraordinary Leader. Their framework is one of the best I have seen on leadership. Leadership is about making sure the best version of you speaks to the best version of us. This is especially true when we are trying to create change or manage disruption. 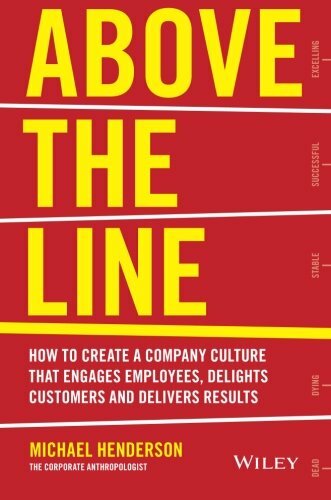 Quality leadership is you, above the line. Maslow's Hierarchy of Needs, Beck and Graves’ Spiral Dynamics, Kegan's Orders of Consciousness are all tools that explore this idea of being above the line. The idea of elevating our consciousness beyond the basic survival needs of 'win at all costs, us against the world'. 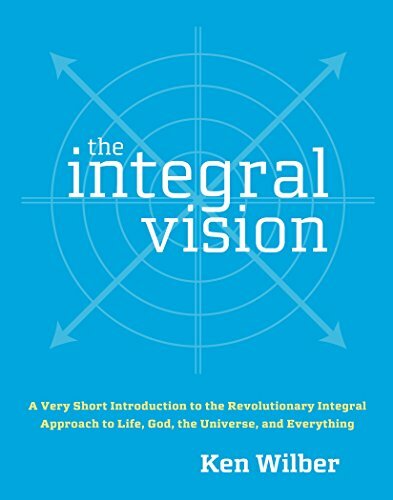 Ken Wilber, the American philosopher and author of The Integral Vision, created this chart as a literature review. It lays out everything from Fowler's levels of faith through to the chakra colours used in many healing practices, and everything in between. The point being; however you look at it this idea of levels of awareness is everywhere. But that table of words presented by Hawkins in Power versus Force remains the most useful tool that I’ve come across. When you lead you to need to stay above the line as much as possible. 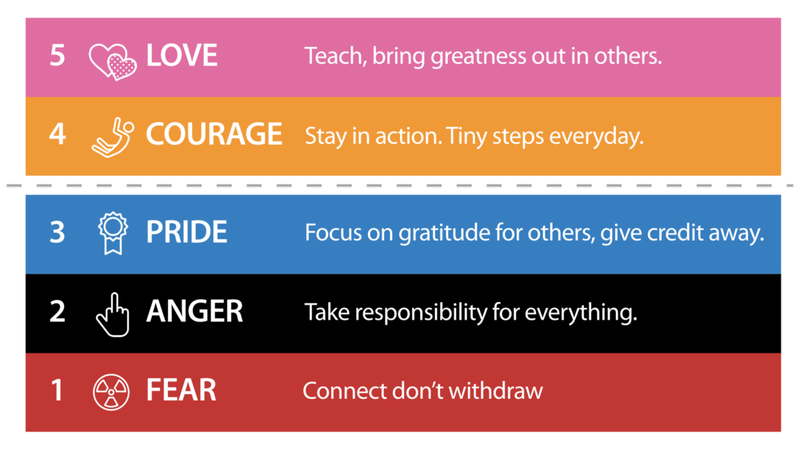 This simple ladder gives you the chance to listen and lead from that place, checking in with yourself and others around you about what level we are all choosing to be at. Summer in Australia occurs over the December–January period and so we know that a great many of our readers take a prolonged break. Us too. Enjoy this time with family and loved ones and may all your intentions for 2018 be above the line. Leadership is about making sure the best version of you speaks to the best version of us. PS. I recently presented some ideas on leading, loving and thinking above the line to a room full of thought leaders. Here is a video from that session at Thought Leaders Business School.